Oh dear, the pictures in this entry are admittedly from last month (hence the peaches). As a result, I don’t remember the details of this delicious galette! I’ve redone what I did at the time, tried to cobble together some recipes from epicurious, but I just don’t remember for sure. Academia-addled brain. I thawed a square of vegan puff pastry, rolled it out to a larger square, rolled out some marzipan really thin, a bit smaller than the pastry, and placed it on the pastry. Arranged peaches (blanched, cooled, peeled, sliced) on top. Now I really can’t remember if I mixed the peaches with any lemon juice, or if I sprinkled a bit of sugar on top. But it’s possible I did. Mind like a sieve. Baked probably at 425? Who knows anymore. All I know is, it was delicious. 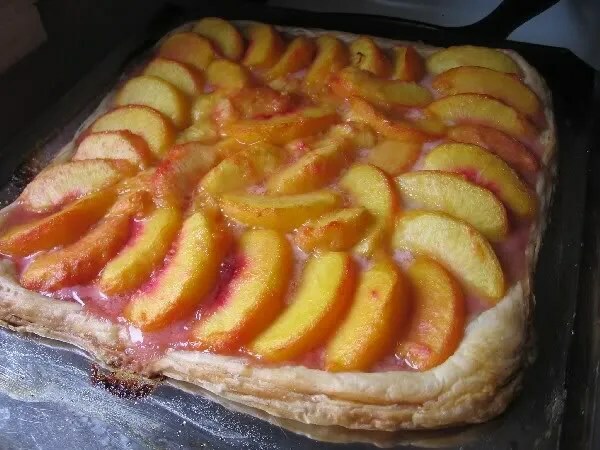 My mom was visiting, so I wanted to make a dessert with all her favourite dessert-y things combined: puff pastry, marzipan, peaches. And she loved it! The rest of the dinner is below: the Vegetable Lasagna variation of Lasagna al Forno Bolognese from Nonna’s Italian Kitchen (using “Prostitute’s Stew” instead of the fake bolognese) and the caesar salad from Veganomicon (but with storebought croutons). 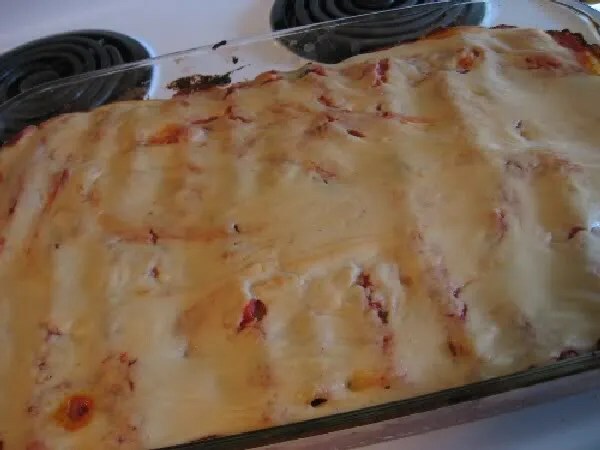 The lasagna was both rich and subtle–Bryanna’s right, it’s not the lasagna we’ve come to expect in North America. Fittingly, it wasn’t quite what I expected– I guess I expected it to be somewhat bolder-flavoured. But I liked it. 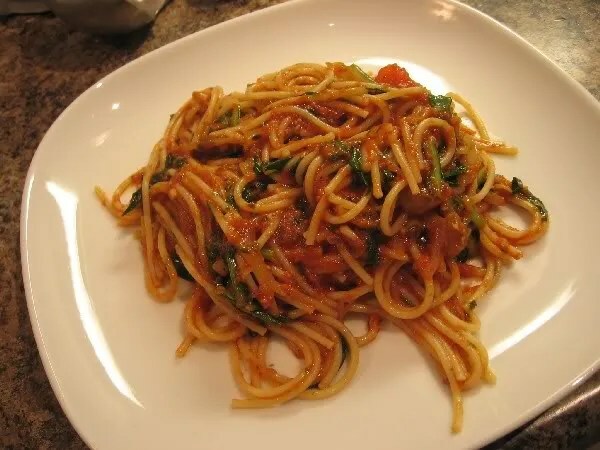 Sometimes a simple pasta sauce is the best! 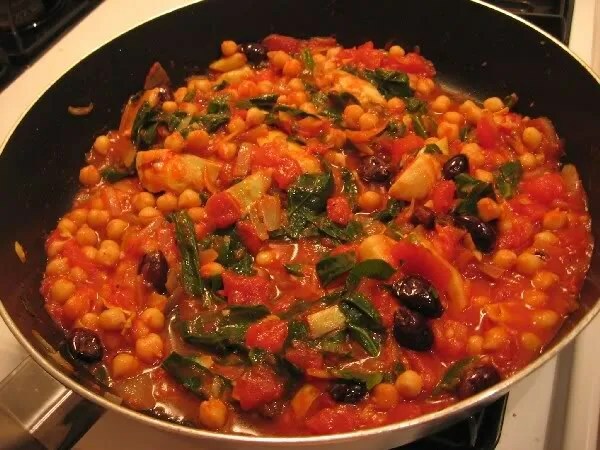 Sauteed collards, canned artichokes, onions, chickpeas, canned tomatoes, black olives. 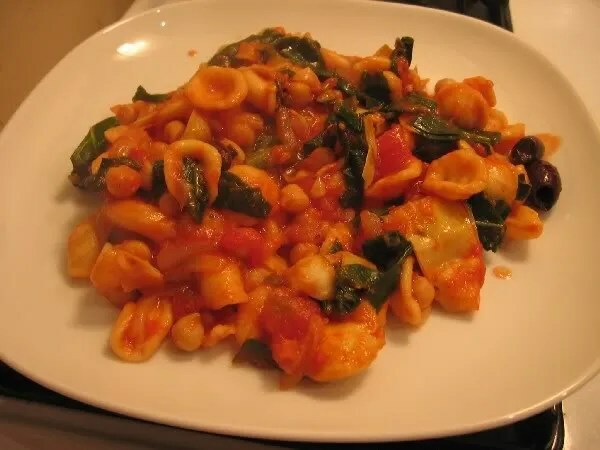 And then mixed with a beautiful dried orecchiette, which I expected not to be vegan when I saw it on the store shelf, but it was. Know what balances out the bitterness of dandelion greens? Caramelized onions and tomato sauce! Delicious. Slow cook lots of onions in some oil and a pinch of sugar and balsamic, and you’ve got yourself a great base for pasta sauce with tomatoes and blanched dandelion greens. Oh, you know, I got distracted with back to school and such. 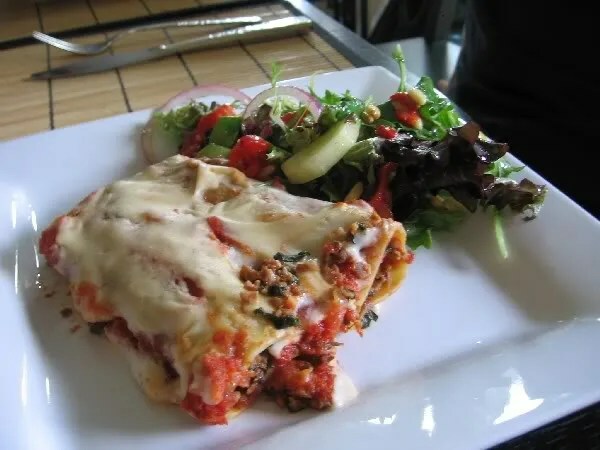 Anyways, here is the Cannelloni from Nonna’s Italian Kitchen. No recipes; you’ll just have to buy this amazing book! The cannelloni have a “meat and spinach” filling courtesy of some handiwork with TVP. My mooma thought it was a very convincing “meat” dish! Frankly I would have liked the spinach ratio to be a bit higher, but that’s just me. The topping was the bechamel sauce from the same book that I’ve been excited about for awhile. Yep, went next door for dinner again and this is what we ate! I am a lucky girl. 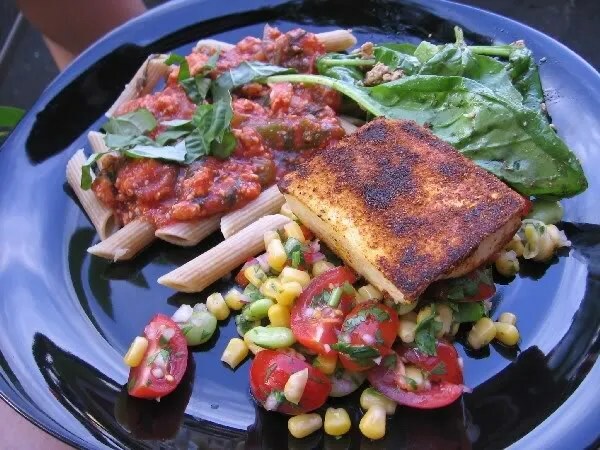 I made the Blackened Tofu and Succotash Salsa from Vegan Soul Kitchen, and Jesse made a delicious tomato pasta dish. A lot of green meals these days! Well, let it be known that bunches of dill sold in stores are very large and take a single girl ages to eat up. 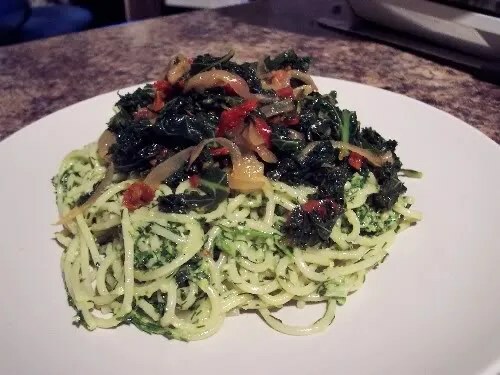 I did my old leftover-herbs standby and made a pesto with parsley, dill, garlic (I never thought I’d say this, but I think I used a bit too much garlic this time. Too many bitter things in this meal to achieve an ideal balance with that much garlic), toasted pine nuts, lemon, olive oil, and salt and pepper. I mixed a dollop of that with cooked spaghetti. In the meantime I’d slowly caramelised a chopped onion with about a teaspoon of brown sugar (it wasn’t the sweetest onion on earth, and I knew the kale and raw garlic would need it. Ultimately, my hunch was right but underestimated: the onion, sugar, and sundried tomatoes didn’t quite balance the scales enough.) To the caramelised onion I added chopped kale and cooked it down with a touch of water, and some sundried tomatoes. What matters most when you’re making up your own dishes is the balance of taste. If you have tangy, sweet, salty, and bitter or earthy, you’re usually set. I’d tweak this a bit, but it wasn’t bad. 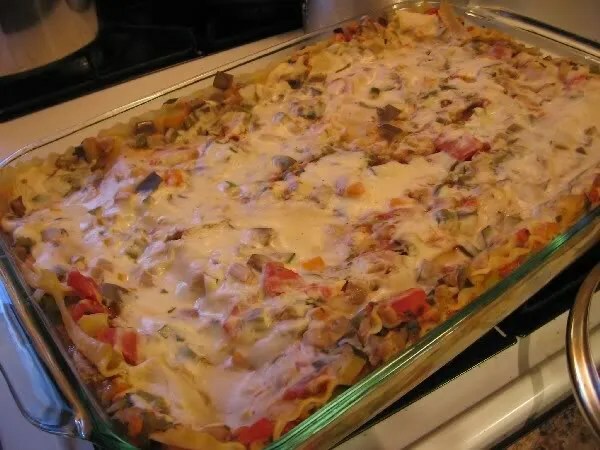 I had a bunch of vegetables needing to be used up, and this turned out to be delicious! First, I cooked and cut up a Gardein “chicken” breast. Then I caramelised an onion, added some dinosaur kale (a rare treat here!) 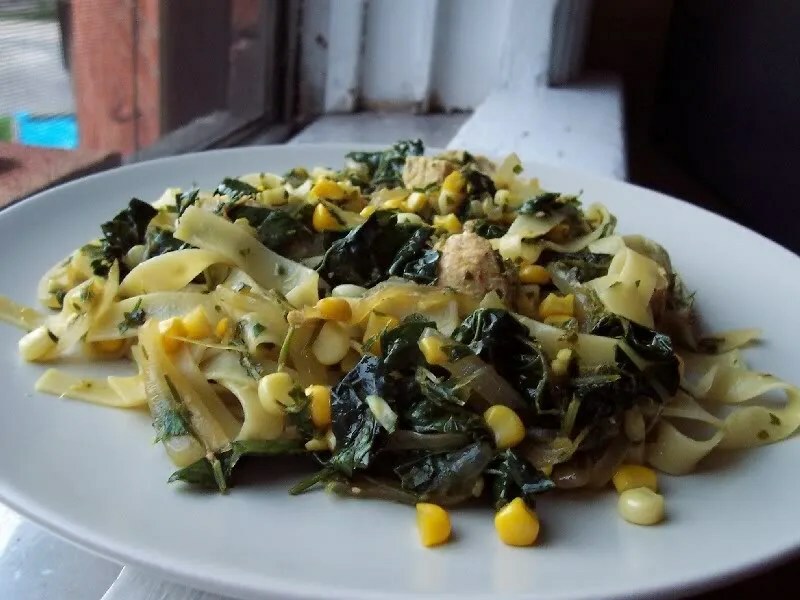 and fresh cut corn kernels, added a touch of water and covered to steam, then added the “chicken” back in and a parsley-garlic-lemon juice gremolata I’d made in the food processor, and when everything was heated, mixed in the cooked pasta.